ROBERTA: A couple of weeks ago, my husband was invited to help sail his friend's 44 foot boat back from Bermuda to Long Island. He leaped at the chance. The captain, an old college pal, and his brother had just completed a race from Massachusetts to Bermuda. With only two of them handling a big boat and a lot of bad weather, they had little sleep and even less to eat. At a cocktail party for the recovering sailors, I heard terrible sailing stories, including one in which the crew of a small catamaran battled an unexpected storm off the coast of North Carolina for 50 hours until one of the hulls filled with water and they realized they were going to tip over. The Coast Guard was able to reach them and they were plucked out of the roiling sea one by one and drawn up into a helicopter. Here's John at the helm, with his pal Fritz as videographer. Not one minute of these trips sounded like fun to me. But obviously the life-threatening adventure gene skipped right over me. I don't mind running my characters through the physical wringer, but I'll stay safely home, thank you. And I might be curious about a crime, but at the FIRST WHIFF of danger, I'd call the cops. How about you all? Did you get that gene? JAN: Roberta, I did NOT get that gene, but I married that gene. I've found myself sailing immediately after a tornado (NOT A GOOD IDEA) spent my honeymoon and four subsequent vacations sailing in the British Virgin Islands (With me the only mate) , and flew in numerous small airplanes (volkswagens with wings) that my husband piloted. I actually grew to like sailing, but thank god the small plane phase is over. My mother used to clip every article of every small plane disaster and send it to me. I know exactly what you mean -- Some people interpret danger as fun. I am not one of them. 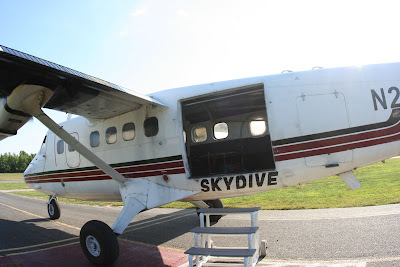 My husband wants to go skydiving. He will go alone. HALLIE: I am a class-A wimp. Boats: Feh! However... the one boat trip we've taken is a cruise down the Yangtze on barely moving water through spectacular gorges with someone else at the helm (and great food) was an experience of a lifetime. The closest I get to adventure is riding a roller coaster. I love-love-love roller coasters and was always the one who lined up with the kids for rides on Disneyland's Matterhorn and Space Mountain because my husband is an even worse wimp than I am. Though he is the designated driver for all round-and-round rides which make me throw up. RHYS: I am attracted to adventure when it comes to traveling to outlandish places, but not when it includes sensation. Terrified of roller coasters and anything else that involves hurtling down anything out of control. My granddaughters obviously haven't inherited my gene and love amusement rides and the scarier the better. I do like sailing and one of the best things I ever did was to take out a Hobie Cat alone on the ocean. It wasn't a very rough ocean and it wasn't a challenging sail, but it was the first time I'd handled a sailboat alone. I got a big kick from knowing it was all up to me and that I could handle this thing. Usually the most adventurous thing I do is drive through LA occasionally. ROSEMARY: I like exotic trips and I enjoy challenging myself physically but the potential for danger, death, disfigurement, dismemberment...does NOT increase my enjoyment level. Climbing to Everest Base Camp we passed a lot of memorials to fallen climbers. If my guide says turn around, I turn around. And I would really not like to drown. We've sailed around the Galapagos and the Greek Islands but I really like to see land. I think sailing across the Atlantic would be very stressful for me! I'd keep having visions of the end of the movie The Perfect Storm - which even though I know it wasn't real - was one of the scariest scenes on film in recent memory. HANK: Laughing. Jonathan leaves the house to walk to the corner drug store. I call after him: Be careful! He says: Of what? And there you have it. DEBS: HATE roller coasters. I have chronic vertigo and there are few things less appealing to me than being made deliberately dizzy. Zip on the danger gene, too. My husband's idea of fun is white-water rafting, camping, climbing, going up in helicopters, deep sea diving. Mine is reading in a hammock. You can see we have some vacation issues. My one little aberration? My husband has been a storm chaser for years, and I love going after a big storm. It's crazy, but I find it more exhilarating than scary. Would I do it with anyone else? Probably not. Give me my hammock. JULIA: Hate roller coasters. Barf city for me. Actually, I hate the movement sensations in most fun park rides. On the other hand, I love sailing and small-pane aviation (despite being prone to motion sickness) and did a lot of white water rafting, rock climbing and bombing down ski slopes when I was younger. 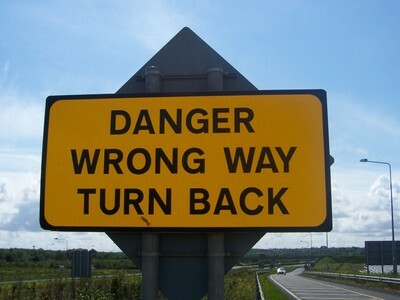 I remember realizing I had become noticeably more risk-averse once I had children: I stopped driving like a bat out of hell (when they were in the car) and was no longer willing to say, "Sure, what the hell, let's do it and see what happens." Nowadays, I think my risk-aversion is more like discomfort aversion. I'm game for any adventure - as long as I can have a hot shower, a well-cooked meal and a comfortable bed at the end of the day! ROBERTA: And you Jungle red readers? How do you feel about adventure? (And sorry Hank did not find an image of a corner drugstore:). I enjoy hiking or riding horses in the wilderness, but with lots of space around should I have to run from something. I get my adventure reading and writing. So funny! Once in a new relationship, (when, you know, you'll do anyting to show how cool you are) I allowed myself to be in the passenger seat while my beau piloted his GLIDER. It as gorgeous ,yes, fine, I have to admit. But at the moment after the tow plane yanked us up in the sky, and we are being pulled along behind it, and then Rob says, okay, I'm going to release the tow line now and we'll be on our own--I said oh, lovely. Tra la. You know what I was thinking. And then there's this..noise. And Rob says "Oh,&%#/!" And you know what I was thinking. Turns out, Rob the compulsive hadn't done it one hundred per cent perfectly, just 99 per cent perfectly. That was not an "Oh,&%#/!" moment I said. That was more like a say nothing moment. I'm all right with roller coasters as long as I don't go upside down. The last time I was at an amusement park with my then-teenaged sons, halfway through the ride I said (okay, yelled), "I changed my mind!" Bungee jumping, paragliding? The stuff of nightmares. But I have happily lived and traveled in places like Mali and Burkina Faso (120 degrees, scorpions, malaria, water-borne diseases) and I traveled all over Japan alone. As long as I'm well connected with gravity, adventure is good. Such an interesting conversation. Like many of you, I'll travel anywhere, but I'm not interested in activities where the likely consequences of inattention are death or dismemberment. HATE rollercoasters and have reached an age where no one will ever guilt or jeer me onto one again. Hubby got the danger gene, though, and has his pilot's license (I don't mind small planes), scubas, and thinks nothing in his life was ever as much fun as tromping around Iraq with the UN in the mid-1990s, inspecting weapons of mass destruction facilities and blowing up a chemical weapons lab. Sheila, glad you made it back--think of all those books that wouldn't have been written! Jack--that's my kind of adventure too...and Hank, yes, know exactly what you mean about how new relationships push your envelope! Was that the end of things right then and there?? Roberta, no, it was just he beginning ,actually..I think we broke up over, um, well, now let's see. I kind of can't remember. Might have been skiing. White water rafting..I still have the photo (someoen stands on a rock and snaps away as you fly by.) Everyone else looks happy, I'm the only one who seems concerned. Skydiving..you couldn't pay me. Surfing...terrified. 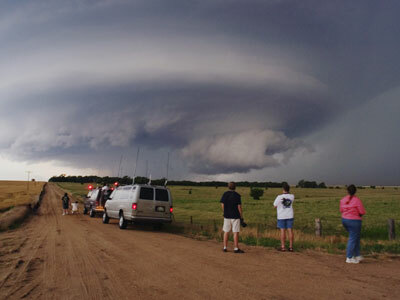 Roberta, love the storm chaser pic! Edith - you lived in Burkina Faso and Mali!? Who knew? I hope you're writing about it. No, no, no, ladies, gliding is the safest way to fly, hands down. Because nothing can go wrong. Mechanical failure? Engine trouble? There's no machinery and no engine. Just long, aerodynamic wings and a few cables connecting the ailerons and the rudder and the elevator. And honestly, even if they somehow miraculously broke, you'd still just....glide down to a landing. Major wimp checking in. I grew up in hurricane country. House flooded to the ceiling, windows blowing in, no fresh water for a month. That's all the adventure I ever need. My husband, on the other hand, while in college went diving in Honduras, where they were greeted at the airport by teenagers bearing automatic weapons who stole all of the food they brought in (first thing to go, cans of Coke) so they had to eat every meal at a bar called the Bucket of Blood. Best week of his life, he says. His mother says, "I choose not to remember that week." Julia, okay, sounds good. we'll all glide some day. I can totally see storm chasing. I do it for news. And yes, it's--kind of amazing. Gliding, I have to admit, was fun once we were actually gliding. GETTING to the gliding part, now that;s a different story. You all know about @junglereds on Twitter, right? Talk about dangerous...please follow us! Well, I feel you all will understand when I say that I had to MAKE myself attend a three-day racing school to do research for my racing mystery. It was absolutely terrifying! And yet to many, it's it's thrill of a lifetime ... not to mention that three young NASCAR drivers were in the course with me (because that's fair, right?). 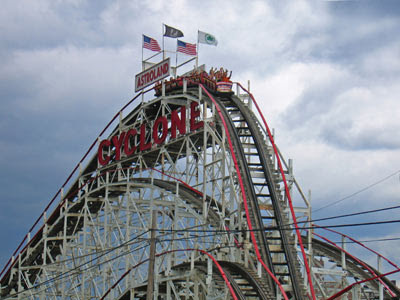 While I love roller coasters, I'm mostly a wimp, and the idea of something that's not engineered, double-checked, and run by a machine (i.e., roller coaster), but is in my own or another individual's hands? Scary. Roberta, I was very young. People didn't evacuate the way they do now, actually leaving town. You just went to a relative's house somewhere away from where Nash Roberts, the New Orleans weatherman everyone trusted, said the storm would land. For Betsy, we went to my grandmother's house. It was brick and (supposedly) indestructible. Ha. Midway through the storm, the picture window blew in. I remember my dad, grandfather and older brother spending the night holding up a mattress to keep the wind and rain out, while all of the ladies sat in a circle, saying the rosary and sobbing. I was 6. My younger brother was 5. We had a blast! No bedtime! No danger! Because I fully trusted that my Daddy could keep that silly hurricane out of the house. You know, for a story, I took a stunt driving lesson from the famed Hal Needham. I learned how to do a bat turn in some kind of snazzy car..I have to admit, as Tammy reminds me, it was really really FUN. I'm sure I'll be writing about this closer to pub of the new book, but as part of my research I went rowing in a double scull with Stevie Williams, OBE, two-time Olympic gold medal winner in rowing. On the Thames, which is much scarier than you'd think (current is very fast at Henley), mostly in the dark. It was terrifying, exhilarating, and maybe the most (legal) fun I've ever had. Reporters have all the fun. I did sky dive, Jan, when Williston Sky Divers down in Florida re-opened about a year after the previous owner died in a plane crash. New owner threw a big party and gave me, the editor of the local newspaper, a free jump. Falling through space was fun, signing the waiver was the scary part. Skipper, I'm impressed. Did I say: never never never never. No, no desire to cheat death before its time! Roller coasters? Well if you think, after this experience … I'm 15, and asked to take my 9 and 8-year-old cousins on the children's roller coaster. We all strap in. On the first down (probably from about six feet from the ground, I start to scream. I am not having fun, I'm terrified and screaming so loud that they stopped the darn thing and I merely stepped down about two feet to get off. The next year my grandmother takes me to Disney Land in California. I think I can manage the Tea Cups. (But no one warns you not to put your head back once it's moving.) Yes, I did, and for the whole ride I was sure I could hear, "Off with her head!"